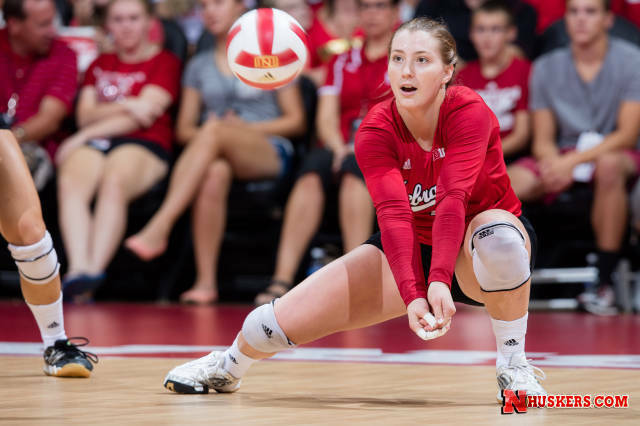 The American Volleyball Coaches’ Association (AVCA) has released their week 3 NCAA Division I Women’s Volleyball Polls, and the Nebraska Cornhuskers, with a perfect 6-0 record, remain the #1 team in the nation. They are one of 5 undefeated teams left in the top 25 rankings (#4 Kansas, #5 Washington, #9 BYU, #17 Santa Clara) as former second-ranked Wisconsin fell at the hands of North Carolina on Friday, who in turn lost to Minnesota on Saturday. The result: the Tar Heels moved up 3 spots to #8, Minnesota jumped a pair to #3, and Wisconsin fell to #6. Other big movers included the University of San Diego, who jumped from 15 to 10 after wins against UC Irvine, #18 Colorado, and #11 UCLA over the weekend at the USD Invitational (including Colorado in a 3-0 sweep); and Purdue, who moved from 20 to 14 after beating 12th-ranked Stanford and Cal Poly at the Stanford Invitational over the weekend. Teams have one more week of non-conference, largely invitational-style play this week before moving into conference schedules the week after. See last week’s poll here. Four teams mentioned on only one ballot for a total of 21 combined points.